Liberal Democrat leader Nick Clegg says drug users should be given treatment rather than being sent to jail. His party will vow to scrap prison sentences for possession in its 2015 general election manifesto. Even those caught with Class A substances such as heroin or cocaine would be spared jail under the plan, which is not coalition policy. 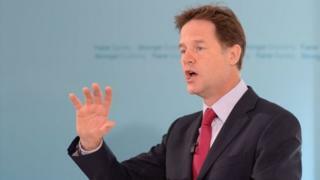 Mr Clegg denied he had gone "soft" on drugs adding he did not want to see them decriminalised. The Lib Dems voted for the policy at their 2011 party conference but BBC Political Correspondent Robin Brant said it would be unlikely to survive any coalition talks with Labour or the Conservatives if next year's general election results in a hung Parliament. Announcing the plan in an interview with The Sun newspaper, Mr Clegg said: "At the moment, we are doing an utterly senseless thing - chucking the people who need treatment behind bars so they simply become even more vulnerable to the criminal gangs who exploited them in the first place." The Lib Dems claim imprisonment does nothing to help addicts become drug free and is a waste of public money that could be better spent on tackling the problem in the community. At the moment, more than 1,000 people a year in England and Wales are jailed for possession of drugs for their own personal use. Mr Clegg told BBC News: "We're saying you shouldn't put people like that behind bars because all you end up doing is turning their offence of having those drugs in their personal possession, you turn them in to hardened criminals. "They actually end up often hooked on harder drugs later and of course the only people who benefit are the criminal gangs, the Mr Bigs, the really nasty people who got them hooked on drugs in the first place. "What those people need is not to be put behind bars. What those people need is treatment." The Lib Dems also want to establish a commission to assess the effectiveness of current drugs laws and alternative approaches, including further work on diverting users into treatment or into civil penalties that do not attract a criminal record, which can affect their chances of employment.